Charming old stone villa early 1600's. Breathtaking view, Pool, WiFi avalable. Property 27: Charming old stone villa early 1600's. Breathtaking view, Pool, WiFi avalable. VillaSubasioRelax is a beautiful and relaxing villa. Five friends relaxed at this beautiful villa on the side of Subasio mountain in Spello, Italy. This was our last stop on our 2 week Italy vacation and we could not have hoped for a better place! Barbara and Loris were gracious hosts. Barbara helped arrange an Ebike tour, transportation to and from and a cooking class prior to our visit. They had a basket of food and drinks ready for us on arrival. Barbara even drove us to the grocery store to get more supplies. The villa was well equipped with everything we needed. The saltwater pool was a great place to unwind after a day of exploring. When our 4 nights were up, Barbara and Loris drove us to the train station. One of the highlights of our stay was the cooking class. It was a family affair consisting of Barbara, Loris and Nana who taught us to make homemade pasta and sauce. Their son, Giacomato was the translator and historian on the town of Spello. It was a warm and wonderful night filled with laughter, good people, wine and lots of homemade food! Nana's dessert was the best we had in Italy! We all want to return and stay longer at VillaSubasioRelax! If you do not have a car, have Barbara help arrange transportation and events prior to your stay. Thank you Barbara, Loris, Giacomato and Nana for a memorable stay! 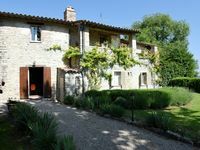 We spent the most wonderful week in enchanting Umbria and we stayed in this perfect home and cannot recommend it higher! The house and gardens are welcoming, comfortable and stunning. Karen was quite helpful during the arrangements and answered my questions without hesitation. Todi is a lovely town and we loved being close to it but also far enough away to relax in the country setting. We loved the view and food from the terrace of the restaurant in Todi called, &ldquo;Pizza Cavour&rdquo;. There was a &ldquo;super moon&rdquo;in the sky the night we dined there which we all decided was a gift from the gods or why right then and why was the sky so clear to witness such beauty. Umbria is a tourist&rsquo;s dream come true. Each we drove to another hill town after having breakfast outside on of the patios beautifully landscaped. After seeing the particular sites of the town, we would have lunch and ooh and ahh over the local cuisine and wines. Back to our home away from ho e to swim and chill-out in the most wonderful pool one could imagine! And did I mention the view from the pool? The lovely town of Todi approximately 5 miles in the distance, overlooking the rolling hills of Umbria and 2 castles, gently resting in the valley just to put the cherry on the sundae. A few restaurants that we absolutely loved: Osteria Piazzetia Dell Erba in Assisi. (A remarkable place, not to be missed! The hippest menu, lovely terrace and great service.) Trattoria del Moro - Orvieto. (Incredible meal! Great day and lots to take in. We walked and walked and loved every twisting turn,) One MUST go to Civita Di Bagnoregio........words can not describe the experience. Do your homework and do not miss this gift! Amazing place and history awaits your visit! We had a fantastic lunch after the trek in Bagnoregio at the hotel, Romantica Pucci which again made us ooh and ahh so ardently that the two cooks came to our table to see what all the excitement was about! Spello was a other feast for the eyes, lovelier than lovely said we all! Another beautiful lunch was eaten at &ldquo;Porta Venere&rdquo; down a windy, cobble-stoned street and away from the other happy sight-seers! The terrace overlooked the valley and was quite cozy and the food was delicious. We were inspired by the owners suggestion to have her charming housekeeper cook dinner for us one evening and it was most definitely a treat! She prepared a full course meal, including a sumptuous wild boar ragout over fettuccine, hunted by her husband!